With the warmer weather upon us, many Canadians start dreaming about heading to the lake. Visions form of standing on the dock or heading out in the boat and casting a line, hoping to catch the big one! Every fisherperson has their “spot” where they know the fish will bite. But have you ever thought about what makes that “spot” the perfect habitat? Many fish species like crappie, bass, and panfish spend most of their time near cover, not in open water. Underwater woody debris is a healthy component of lake environments. Sunken logs, trees, and branches provide excellent habitat for wildlife, including fish, turtles, birds, invertebrates, and more. Beaver activity, wind, erosion, or water inflows from rivers or creeks naturally deposit such woody debris into a lake. However, increased human activity and development has significantly reduced the amount of natural woody debris from lakes (WC & LCSC 2015). Shoreline property owners often remove woody debris from their waterfronts for aesthetic reasons, easier swimming, and safer boating, reducing habitat for fish species and other wildlife. As waterfront development increases, the amount of woody debris decreases (Wolter 2012, Jennings et al. 2003). Thus, humans disrupt this link between the riparian forest and lake ecosystems, and as a consequence they remove critical fish habitat. The presence of woody debris affects the abundance, growth and diversity of the fish species in lakes (Helmus & Sass, 2008). It provides food sources, feeding areas, shelter, and spawning habitat for wildlife. Communities can promote the health of wildlife populations and improve water quality by creating additional woody debris habitat, such as in-water brush piles. Brush piles can provide fish with a food source, as well as shaded areas to rest, spawn, and escape predators. They prevent suspension of sediments and improves water clarity by reducing the current and wave action that can move sediments (Engel & Pederson, 1998), similar to how trees reduce erosion. Consequently improving water quality as well. Brush bundles are piles of branches, sticks, twigs, and roots of trees that are tied together using nylon rope or wire. Cement blocks are attached as anchors to sink the bundles to the bottom of the waterbody, waterlogging the woody debris so that it doesn’t float back up to the surface. These can also be called underwater brush bundles or in-water brush piles. They are placed in waters that are more than 12 feet deep, to ensure they don’t interfere with boating or other cottage activities like swimming, tubing or water skiing (WC & LCSC, 2015). 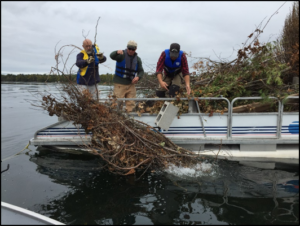 Fish habitat enhancement projects are a way for stewardship organizations, lake associations, fish and game clubs, and other groups to improve their local lake ecosystems. By working collaboratively with others, the community can rally together and enhance lake quality and fish habitat. 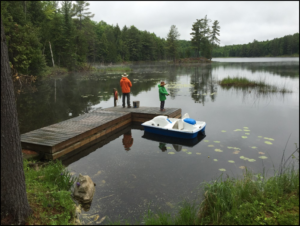 If you or your lake association is interested in enhancing your fish habitat, more information is available in Watersheds Canada’s Fish Habitat Toolkit: In-Water Brush Piles in Ontario, prepared in partnership with the Lanark County Stewardship Council. https://watersheds.ca/our-work/resources/publications/ or contact Melissa Dakers at dakers@watersheds.ca or 613-264-1244, we currently have funding for a Brush Bundle project in Eastern Ontario for the fall of 2017 for an interested lake association. 1. Watersheds Canada, and Lanark County Stewardship Council. 2015. Fish Habitat Toolkit In-Water Brush Piles in Ontario. 3. Jennings, M.J., E.E. Emmons, G.R. Hatzenbeler, C. Edwards and M.A. Bozek. 2003. Is littoral habitat affected by residential development and land use in watersheds of Wisconsin lakes? Lake and Reservoir Management 19:272-279. 4. Helmus, M.R., and G.G. Sass. 2008. The rapid effects of a whole-lake reduction of coarse woody debris on fish and benthic macroinvertebrates. Freshwater Biology 53, 1423-1433. 5. Engel, S., and J.L. Pederson Jr. 1998. The construction, aesthetics and effects of lakeshore development: A Literature Review. WDNR Research Report 177.